What animal comes to mind when you hear these words: relaxed, languid, graceful, calm, serene? For me, it’s always a cat. I’m a dog person through and through. I identify with their boundless eagerness to explore, and I delight in the friendly regard that characterizes most breeds. But during childhood, all but one of our cherished pets were cats, and I love them almost as well. There are a lot of jokes about how indifferent cats can be, but those of us who have been close to kitties know better. Though they have an innate dignity that may prevent them from showing the uninhibited enthusiasm so common to canines, they can and do form deeply affectionate bonds with humans, and their company can be every bit as therapeutic. Next time you feel frazzled and frustrated, spend some time with a friendly feline. If you don’t live in proximity to one, just imagine a quietly purring cat curled up at your feet, and channel their sleepy but sharp gaze that sees their world through half-closed eyes. Perhaps you will feel a nice nap coming on. Awake or asleep, I wish you pleasant dreams. Thank you Sheila. We do miss Daddy. 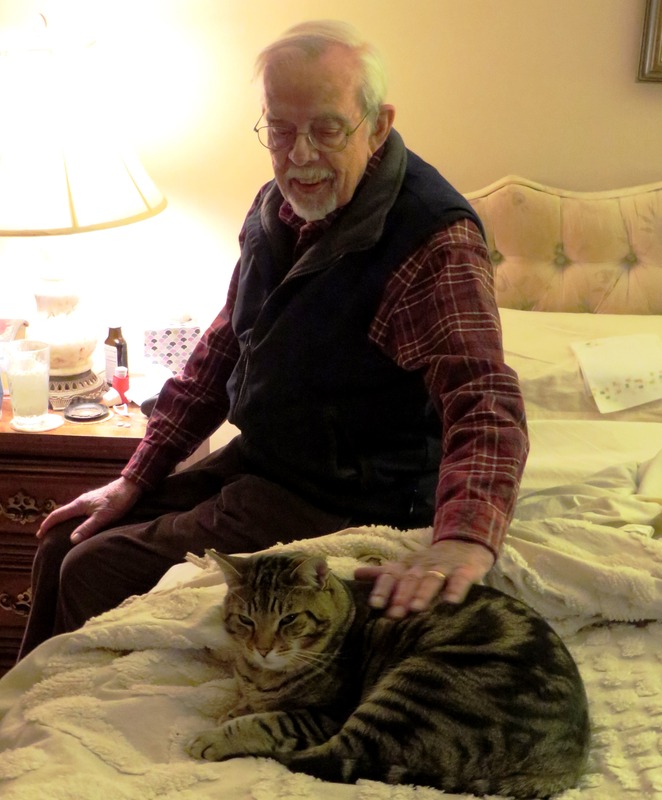 He loved animals of all kinds, and Mr. Kitty was a nice companion for him in his final years. And patient. When we moved into our current house of almost twenty years now, unbeknownst to us our neighbor had moved and abandoned their gray tabby. For years, four or five, Cinder would make periodic appearances behind the house, hunting, doing whatever else cats do. So imagine my surprise when one morning at my appointed arising at 430-ish, I turned on the under counter lights by my coffee pot and there in my window sits Cinder the cat. Within a few months, every time I’d come in the kitchen and turn on the light, within a few seconds Cinder would jump up the 3′ or so onto my window ledge. I rewarded her with milk and expensive canned cat food; in the cold winter months I’d put the food on the kitchen counter and open the window for her to come in. She grudgingly let me pet her but more as an accommodation than a preference. Her nod to our friendship was the occasional snake, chipmunk and once a roof rat, a fearful looking beast she presented with great indifference. When her time finally came many years later, we brought her in the house, let her sleep in bed my small son made for her in the basement. We always kept the garage door cracked that she could inevitably leave, but for a few days she was always there in the morning until she wasn’t. Here’s to Cinder, best cat ever. Short for Cinderella, named by a sweet little girl now in her second or third year of medical school at UAB. But apparently not sweet enough to talk her parents, in the midst of a complicated and scandalous divorce, to bring the cat along with them to wherever she was going next. Her loss was our gain! I think most animals can be therapeutic. I have never spent much time with cats. (mother was terrified of them) so I have very little reference other than the one we had for many years. She was a love and the dog and cat thought they were siblings. I miss having one because they do bring your blood pressure down by just stroking them. They can be very intuitive as well. I’ve often thought about having another but decided against it. For now. Your dad looked so happy to have his bud close at hand. Marlene, we are in the exact same spot; not ready to adopt another animal into the family yet, but missing the loving and therapeutic presence that only a furry or feathered friend can provide. Perhaps in time our schedule will stabilize to the point that we can be confident of having the time to devote to one. Until then, I’m grateful for the memories, and for the borrowed joy I get when I visit with our neighbors’ cute critters. I just send a large donation to the human society to feed shelter animals that I can’t bring one home. I also go to the animal rescue site every day and click to feed the animals. It doesn’t cost anything and helps a little. I’m at an age where another someone to take care of could be and expense I can’t handle. But somehow I always find a fur baby out and about to get a little love from. They do take a lot of time and attention. Marlene, I have thought many times that I would like to volunteer at a rescue site so I can interact with the animals. Truthfully, I’m a bit afraid to do it because I’m the type who might lie awake worrying about one or another of them. I would want to adopt them all. I have a friend who fosters animals and I think it would take a special person to do that (for animals and especially for humans, which carries infinitely more risk in terms of having one’s heart broken). I am glad there are so many of us who find ways to help however we can. The shelters and other important outreach efforts in all sorts of areas of need (both human and animal) are always ready to welcome many kinds of help, whether a gift of time or money. I remember our first blog anniversary when I had a drawing for a $50 gift card. Kelly (aka Petals aka Boomdeeadda) won it and told me to donate her prize to a local animal shelter. That was so much fun, and inspired the 2nd anniversary’s celebration. I adore cats and as I write this I have Slinky sleeping on my healing leg, Mouse next to the cards I’m supposed to be addressing and Lindy nearby primping and looking content. Animals are great companions, non-judgmental, adoring and wonderful to be around. I also grew up with cats and think you’ve described them so well. It’s nice to see your beloved Daddy with his cat. I see so much of you in your dad seeing him here looking down. I don’t know why I didn’t notice that before. Holding you in my heart, dear Julia. Alys, I was thinking of you and your feline friends, among many other cats I’ve known via blogs or in person, when I wrote this post. I definitely need to work on channeling my inner kitty cat more often. A cat seems, almost always, to know when to turn the attention and focus elsewhere. Having said that, yesterday I heard from a friend of mine who is dealing with a cat that is decidedly different from the ones describe in this post. So there are exceptions to everything! When I was younger, many people told me I looked EXACTLY like my Daddy. An equal number said I looked EXACTLY like my Mama. I was happy either way. I do have my Daddy’s mouth and teeth (big) and chin (small) though I missed most all the lovely Chiricahua traits that my siblings got from him — dark eyes, unblemished olive skin, thick dark hair and the ability to get an even darker coloring almost with the change of the calendar, never needing to lie out in the sun to look tanned. I hope all my years of sunbathing never catches up with me. My doctors (and my brother’s melanoma and sister’s squamous cell skin cancer) have really put the fear in me. I’m a paleface from now on. Julia, I got my mom’s coloring as well which means fair skin and terrible burns. Both my sisters, like your sibs, tanned easily. I’ve had two skin cancers removed with MOHS, one about five years ago, and one just two weeks ago. I had the stitches out today. It’s scary business, and good to get regular checkups. I think you’re beautiful, so whatever combination you ended up with works well for you. Wow, your experiences are another cautionary tale for all of us. Hope your recent medical procedures will give you a great start for the New Year, feeling fit as a fiddle and ready to enjoy a healthy, happy 2016! Alys, that sounds like a wonderful Christmas Eve. “Health” is a great theme for 2016. I really like the idea of choosing a word for the year; it’s much more concise to have a one-word focus than to write up goals. Hmmm, I wonder what the word for the year will be for me? I have several ideas, but can’t choose from among them. Maybe “rejuvenate” or “refresh” would be good. I find myself steering mostly to verbs rather than nouns; interesting. Hi Julia. I like the idea of “rejuvenate” or “refresh” and look forward to hearing what you choose. Sometimes you choose the word and other times it chooses you. New Year’s resolutions don’t generally work (ask any gym owner) but simplify with a word is magical. Thanks for your well wishes. I’ve walked in the house without crutches or the foot brace this week, but after an hour my foot is swollen and red, so I need to back off just a bit. I’m looking forward to the energetic start you suggest. I hope you’ve had an enjoyable holiday so far. Alys, hooray for your first tentative steps! But I’m sorry for the swelling and redness. Are you allowed to soak it anytime soon? Re: my choice of word for the year — I just wrote a post about it today, that will publish in one week. Stay tuned! Oops! Make that “will publish on New Year’s Eve” — that tells you how far behind I am on pretty much everything! Julia, I am allowed to soak my foot (no more stitches and the exterior is fully healed) but the ice seems to do a better job than heat. I know plunging my foot in an ice bath might help, but that is so hard to do this time of year. Even in the summer it’s a challenge. I see my doctor again on Monday. Happy New Year to you too, Alys! I’m with you; ice water for feet at this time of year? No thanks! Still, it’s bound to be easier in CA than it would be in many other states. It’s finally gotten COLD here — meaning 30’s (I can hear K laughing at me calling 30’s cold!) but we have been so spoiled by the warm December weather that it’s almost a shock to the system. Hope your doctor gives you a wonderful report today! Hi Julia, It’s all relative, isn’t it? Someone living in Hawaii would find California cold. Californian’s find the east coast, cold, and anyone living in Alaska must need an extra layer of fat to survive those winters. Ha! I just started PT this week. Onward. I actually prefer the NorCal climate to Hawaii’s or anywhere else. It has just enough variation to make things interesting. I’m not one who goes in for temperature extremes. Virginia is pretty moderate but it’s as close to cold (or hot) as I want to get. OUCH, PT! are you sore? I know it can be painful in the beginning. Hope it’s not too hard for you. My daughter in law Rachel is a cat person. She has two cats, Melitius and the other one. I got her one of the Grumpy Cat movies for Xmas, called “Grumpy cat- Worst Christmas ever”. What a title. I hope it is a comedy as it is supposed to be. Have you heard that cats can see and experience a fourth dimension, which is readily apparent when you see them clawing at the sky as they often do? They are saying the S word here in Seattle. Have not seen much S for a couple of years. My love of S has diminished in recent years. Michael, my friend Amy introduced us to Grumpy Cat and I have laughed so many times over him (or her?) since then. I had no idea there was a movie coming out. I have heard that cats can sense all sorts of things, including impending death of a person in some cases, and it sounds quite believable to me. The have a very intuitive look about them, I think. In contrast, I’ve always been a cat person. They tend to have better breath and don’t lick you after drinking from the toilet. On the other hand, when they’re naughty, they jump on the table and counters, and those same paws have been in a litter box. Ew. But my best cat ever, Oliver, would know when I was feeling sad as a teenager, and would come and find me so that I could cuddle him. He was very tolerant, and so calm that his peacefulness would rub off on me when I needed it most. Susan, Oliver sounds a lot like my sweet Kitt Katt, the calico who was part of our family when I was growing up. She was amazingly patient, and such a comfort. Because she lived mostly outdoors (or on the porch), we never had the problem of her jumping up on counters and tables, but I’ve heard lots about that from others…I never thought about the litter box connection, though. Ew indeed. However, I found that with Pasha (or for that matter, with Drew and Matt when they were babies) our tolerance for icky stuff quickly increased. Perhaps one reason our four-legged family members are so good for our mental health is that they help us relax about stuff that tends to freak us out unnecessarily. Chilling out about the details is not such a bad trade off for all the joys we get from the animals in our lives. Julia, that’s true. We are certainly more open to tolerance when it comes to our pets, with their unconditional love for us.